I searched and searched for a good recipe for greek tacos, and finally one popped up in my feed the other day. After the first bite, my husband said, "Add these to the rotation!" My thoughts exactly. So, they are now part of our "rotation". The only thing that requires some time, is the homemade tzatziki sauce I made. I highly recommend you make your own. It doesn't take long and can be made hours in advance. The best part, every child ate their dinner. Heat olive oil in a large non-stick skillet over medium-high heat. Add in red onion and saute 2 minutes then add turkey, season with salt to taste and cook, breaking up and stirring occasionally, until nearly cooked through. Then add garlic and continue to cook until turkey is cooked through. Stir in tomato sauce, chicken broth, oregano, thyme and coriander. Season with salt to taste. Bring to a boil then reduce heat to a simmer and cook uncovered, stirring occasionally until sauce has reduced, about 6 - 8 minutes. Stir in lemon juice. Serve warm over tortillas with toppings listed. Directions: Place diced cucumber in a mesh strainer or colander and sprinkle with salt, toss to evenly coat then allow to rest 20 minutes at room temperature. Rinse cucumbers and place over several layers of paper towels. Squeeze some of the liquid from cucumbers (almost as if wringing moisture from a cloth). Place cucumbers in food processor and pulse to chop fine. Dab cucumbers with a paper towel to soak up more moisture, then add in Greek yogurt, garlic, lemon juice, olive oil, parsley, and dill and season with salt to taste. Plus to blend. Store in refrigerator in an airtight container up to 3 days. For the tzatziki sauce, I used nonfat plain yogurt and it turned out great. I think next time I will add feta cheese to the sauce. I love chicken pot pie, but I love chicken pot pie crumble even more. It's a one pot dish that can be served alone or with a salad. It does involve some dishes, but I do them all while it's baking in the oven. Then you basically have no big dishes to do after dinner. 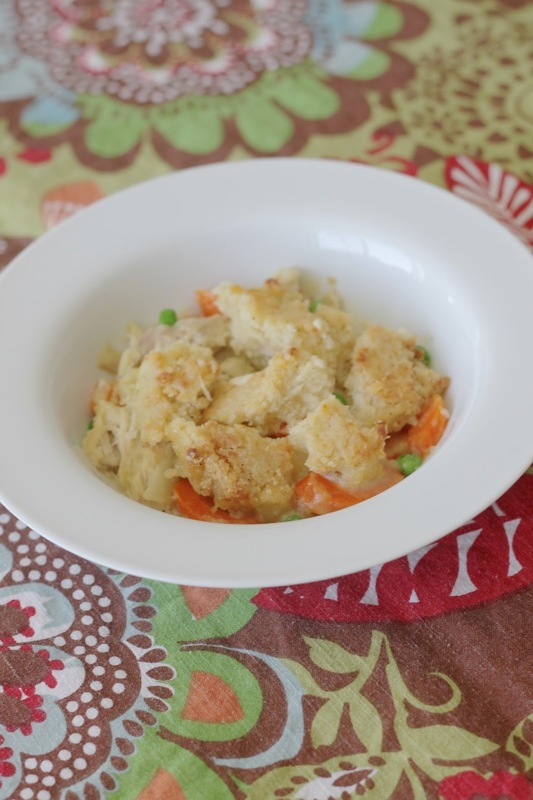 The biscuit crust is so good with the parmesan cheese and adds a great texture to the dish. I've been making this recipe for a few years now, and I love it just as much as the first time I had it. To prepare the chicken, place the chicken and broth in a large Dutch oven or pot and bring it to a simmer over medium heat. Cook the chicken until it is just done (don’t overcook or it will dry out) – about 10-12 minutes. Alternately, if you are planning in advance, you can place the chicken and broth in a slow cooker and cook on high for 3 hours or low for 5 hours. Transfer the cooked chicken to a medium bowl. Pour the broth through a fine-mesh strainer into a liquid measuring cup and reserve. Return the pot to the stovetop (no need to wash if you used it to cook the chicken). Preheat the oven to 400 degrees. In a large bowl, combine the flour, baking powder, salt, pepper, and cayenne. Sprinkle the chilled butter pieces over the top of the flour. Using your fingers or a pastry cutter, rub the butter into the flour mixture until it resembles coarse crumbs. Stir in the Parmesan cheese. Add the cream and stir until just combined. Crumble the mixture into irregularly shaped pieces onto a baking sheet lined with parchment paper. Bake the crumble topping until fragrant and starting to brown, about 15 minutes, tossing halfway through. Set aside. For the filling, heat the olive oil in the now-empty pot over medium heat. Add onion, carrots, celery, salt and pepper. Cover and cook, stirring occasionally, until just tender, about 5 minutes. While the vegetables are cooking, shred the chicken into small bite-size pieces. Transfer the cooked vegetables to the bowl with the chicken; set aside. Over medium heat melt the butter in the empty pot. Stir in the flour and cook for one minute, stirring constantly. Slowly whisk in the reserved chicken broth and milk. Bring to a simmer and stir occasionally until the sauce thickens, about 5 minutes, taking care not to burn the bottom. Add 1/2 teaspoon salt and 1/2 teaspoon pepper. Remove from the heat and stir the chicken, vegetables and peas into the sauce. Pour the mixture into a 9×13 pan. Scatter the crumble topping evenly over the filling. Place the 9X13-inch pan on a rimmed baking sheet and bake at 400 degrees until the topping is well browned, about 15-20 minutes. Let the casserole stand for 10 minutes before serving. I feel like I'm always trying a new chocolate chip cookie recipe, just to see if it's better than the best one I think I have. When I came across this recipe, I knew I had to try it. When the recipe calls for more brown sugar than white sugar, I know it's probably going to be a keeper. 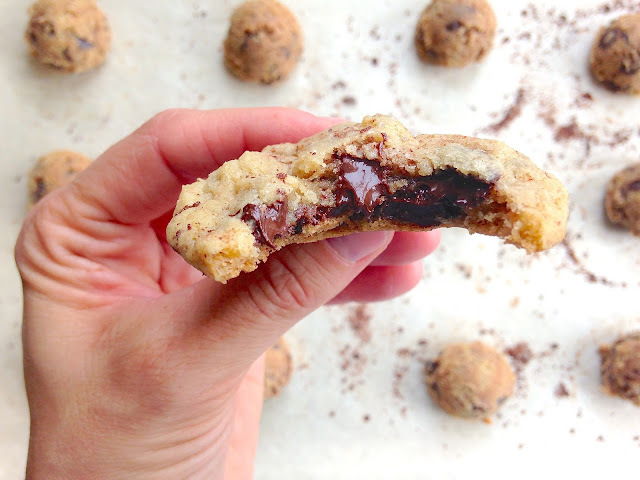 I have a few select favorite chocolate chip cookie recipes, and this one just made the list. I used semi-sweet chocolate chunks from Trader Joe's (my fav! ), semi-sweet chocolate chips from Trader Joe's and a dark chocolate bar from Trader Joe's that I grated in my cheese grater. Those are just what I had. Feel free to use any type of chocolate you want. One of my favorite things to do with chocolate chip cookies is sprinkle a little sea salt on the tops, just before baking. It adds the best flavor mixed with the dark chocolate. I have plans to make these again soon and freeze a bunch for later use. Enjoy! 2. In a medium bowl, whisk together flour, baking powder, baking soda, and sea salt. Set aside. 3. Using a stand mixer, cream butter and sugars together for about 3 minutes. Add in the eggs and vanilla and mix until combined. With the mixer on low, slowly add in the dry ingredients. Stir in the chocolate chunks, chocolate chips, and grated chocolate. 4. Form the cookie dough into balls, about 2 tablespoons of dough. Place on prepared baking sheet, about 2 inches apart. Sprinkle with sea salt, if desired. 5. Bake cookies for 10-11 minutes or until the edges are slightly golden brown. 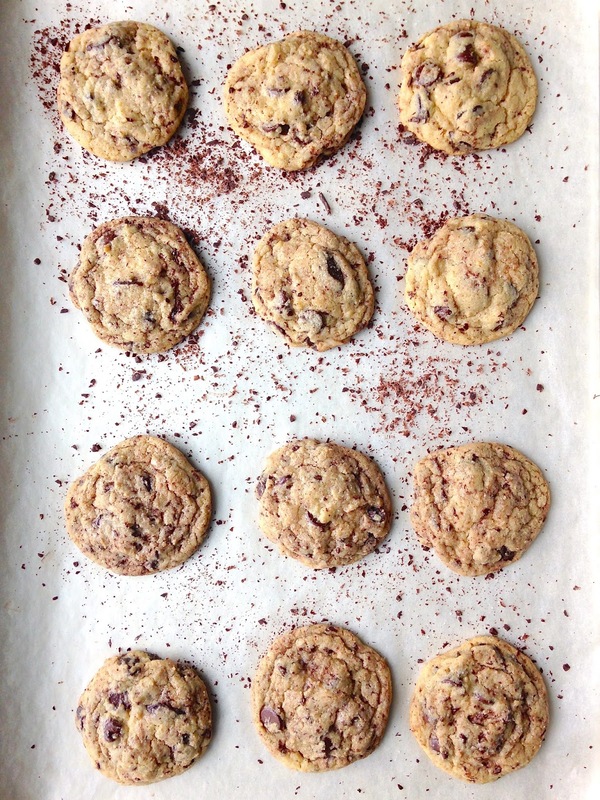 Remove from oven and let cookies cool on the baking sheet for 2-3 minutes. Transfer to a wire cooling rack and cool completely. Note-to grate the chocolate, use a chocolate bar and cheese grater. You can use semi-sweet, dark, or milk chocolate. Choose your favorite! The cookies will keep in an airtight container for 3-4 days. You can also freeze the cookies! This is one of those recipes you are so happy you got ready the day before because dinner ends up being a breeze the day you actually make it. I recommend marinating this for about 24 hours if you can. I pan fried mine on the stove, but on the bbq would be great. It has the best lemon flavor without being too overpowering. This would be delicious served over a salad as well. Stay tuned for the Rice Pilaf recipe I used as a side. Combine all ingredients in a large ziplock bag and add chicken. Place in fridge overnight. Grill or pan fry when ready. You can also place frozen chicken in the bag of marinade and put back in freezer for later use. I used 8 of the thinly sliced frozen chicken breasts from Costco because they cook fast and hold the marinade better. I usually think it's a crime to cook dinner on a Friday night, but I had lot's of leftover broccoli from the week that I couldn't bare to see go to waste, so I made broccoli cheddar soup. I avoid all broccoli soups that call for Velveeta cheese in them. What is that stuff anyway? I used a copycat Panera Bread recipe and it's so good. Definitely worth the 30 minutes I spent in the kitchen on a Friday evening. A few children in my family think if they see anything green in their food, it will kill them. I'm happy to report that it did not kill anyone and was enjoyed by most. Melt butter in large stockpot. Add onions and cook until soft, about 4-5 minutes. Add carrots and broccoli cook for additional 3-4 minutes, season with salt, pepper, paprika and hot pepper sauce. Pour chicken broth and cream into vegetable mixture. Add one teaspoon mustard, whisk until smooth. In a small bowl or cup, whisk the cold water or broth together with the cornstarch until smooth. Pour into the stockpot with the vegetable mixture. Whisk until smooth. Add additional salt and pepper to taste. Add cheese and cook just until cheese is melted. Reduce heat until ready to serve. -Sharp or extra sharp cheese is best for this recipe. -If you want to make a heartier soup, cook a couple of chicken breast halves and shred or chop before adding to the finished soup. We didn't have any leftovers, so I would double this the next time I make it. I also shredded my carrots. We love granola in our family. We like to add it to yogurt and fruit, eat it plain or as a bowl of cereal. I only made one batch since it was my first time trying it out, and it was gone the next day. I will most definitely triple it the next time I make it. I used chopped, toasted almonds found in the bulk section at Winco instead of the slivered almonds, and I used vanilla bean paste instead of coconut extract. This granola is crunchy, packed with coconut flavor and easy to make. Preheat oven to 275 degrees. In a large mixing bowl, toss together oats, almonds, and coconut, set aside. In a separate microwave safe mixing bowl, combine brown sugar, honey, coconut oil and salt and heat in microwave on HIGH power 1 minute stirring once halfway through heating. Stir in coconut extract and pour mixture over oats and toss until evenly coated (it will seem dry at first, just keep tossing). Spread oat covered mixture in an even layer into a rimmed, Silpat or parchment paper lined cookie sheet. Bake in preheated oven until golden brown, about 45 - 55 minutes , stirring every 15 minutes. Remove from oven and cool completely (it will harden as it cools). Store in an airtight container. I found this soup a while ago on the 71 toes blog. It looked fast and easy, so I wanted to give it a try. Plus, this month the Mango salsa is on coupon at Costco. I thought a few of my kids would turn their noses at this soup, but as we began to eat, it was silent. It was either two things: my kids were starving, or they really liked the soup. I think it was both. I started out halving the recipe, but quickly got everything out and made the whole thing. We had two extra people over for dinner and we had a good amount of leftovers. Perfect for a few lunches over the next couple of days. I bought a rotisserie chicken at Costco and added black beans. Great soup to serve a large crowd. Bring all ingredients to a low boil, stirring as it heats up. Simmer for a few minutes before serving.